While A. 's mom was in town we took her to see Tatzu Nishi's Discovering Columbus public art installation. 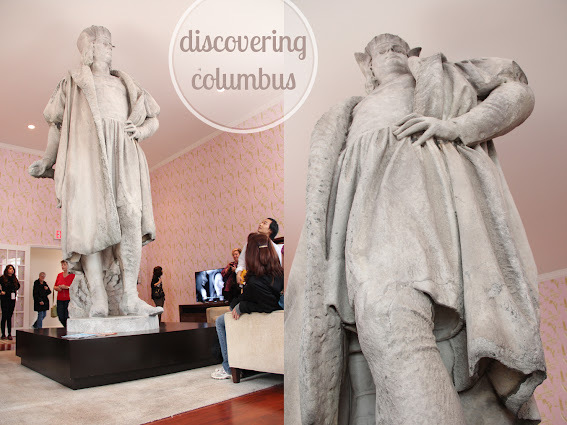 The Japanese artist created a living room around Manhattan's Christopher Columbus statue that was erected in 1892 to commemorate the 400th anniversary of the explorer's journey to the Americas. 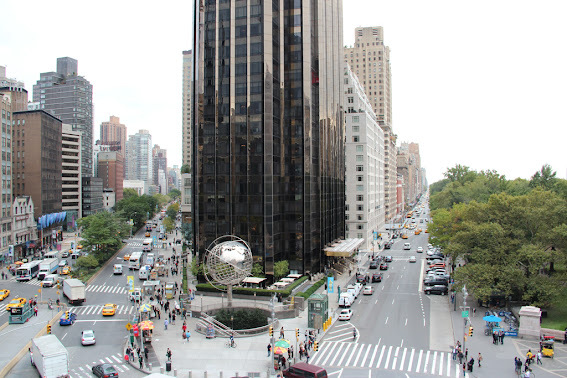 Feel as you wish about the man, the monument has been an icon at Columbus Circle, just yards away from Central Park, and the fountained area serves as a little piece of repose as the traffic and crowds rush around you. Nishi's latest installation attempts to provide a more intimate perspective to a statue that has marked that spot for the last 120 years - or at least it would be if a stream of viewers weren't constantly marching into the room along with you. The fully-furnished living room, which sits atop the statue's granite column at more than 75 feet above the street, houses the 13-foot-tall statue and makes it seem as if it's just part of the contemporary décor of some well-to-do couple's home. 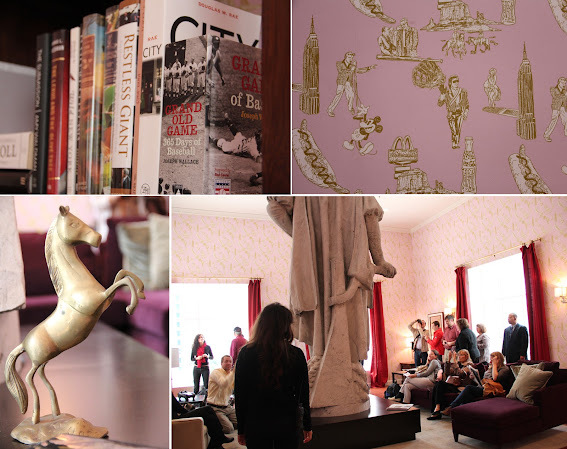 A collection of books on various topics line the bookshelves, the flat screen TV is turned to the news, and the wallpaper is detailed with American pop culture references that Nishi gathered from watching Hollywood movies and television as a child. As someone who's only rushed past the statue her whole life barely stopping to squint up into the sky for a better look at it, it was cool to see the marble piece from so close and in such a different environment. The column rises up through the wood floor and the room is built around it, but it's so seamless that it looks like someone cut off the statue and placed it on top of the table. We sat on the comfy couches just inches away from his feet pretending that we lived in a fancy home that could house such a giant art piece and provide such an amazing view of the city. Discovering Columbus will be on view through Nov. 18 after which the enclosed space will house workers as they restore the statue during the winter months. For free timed passes visit publicartfund.org. This just seems really cool. You should get yourself a pass for the next time you plan to visit the city. The wait on line wasn't long at all and it's free. I'm sure you'd get some nice shots up there, too.